Trilogy has been out for a few weeks now, but I am only now able to review it. Sorry guys! I am, however, very happy to finally have my hands on it. It's a mid/high end product that disappeared for a few years during the Panini era, but returned last year. Let's see how this year's version of it looks! The Trilogy base cards come on medium-thick white stock. A picture of the player is in the center of the card with a simple design element rounding it all out. Though Upper Deck is usually known for very clean cards, these Trilogy base cards are almost too clean in a way. The upper right and left corner portions of the card feel a bit to bare. And while there are nice gold foil touches on the card, the cards seem very spartan and unadorned. It would have been nice if Upper Deck had put more here. As the cards stand, they are underwhelming. The back of the base card uses elements from the front to tie the two together. The oval photo of the player's head gives the card an old fashioned look - as do the colors used. There isn't anything too exciting to see on the back of the trilogy cards. Overall the standard base cards in Trilogy this year haven't come across as very memorable. I'm not sure why anybody would want to but a set of these cards together. Trilogy's Rookie Premiers rookie subset is back again this year with the three tiered system. Each rookie can be found in one of three levels with parallels at each level as well. Level 1 rookies are numbered to 799. The card has the radiant sun design of the base cards but with wider and lower rays. The cards are all foil and look much better than the standard base cards. The foil really helps these cards with a solid background pop. The base set could have benefited from this same type of foil. 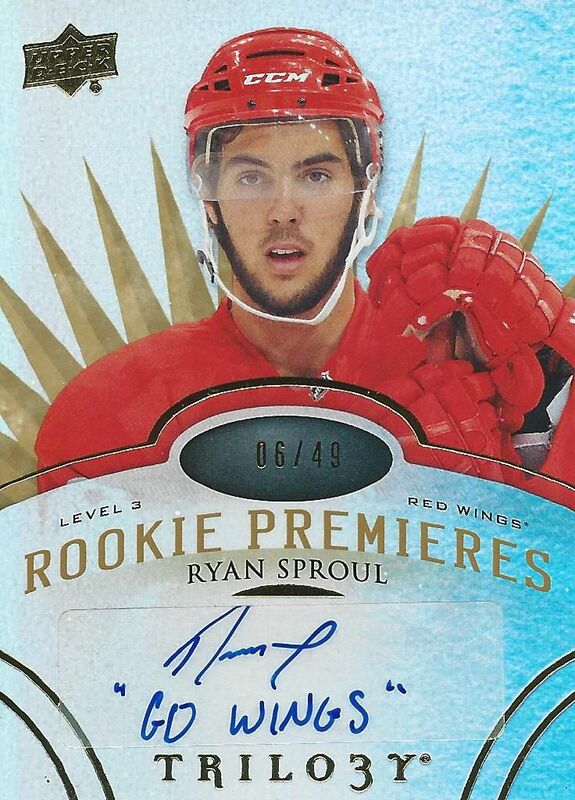 Level 2 and 3 Rookie Premier cards contain autographs, with the level 3 cards including a special inscription. The inscription will say: Go _______. With the space filled in with their team's name. It's a nice concept to add a bit of flare to a standard autograph. These cards are much more limited as there are only 49 of each. Last year Trilogy came in a box with three mini-boxes inside - that's not the case this year. The box comes with 9 packs - all loose. Boxes will have jersey cards to autographs to thick glass looking acetate cards. Also look for parallel cards with unique numbering depending on player stats. 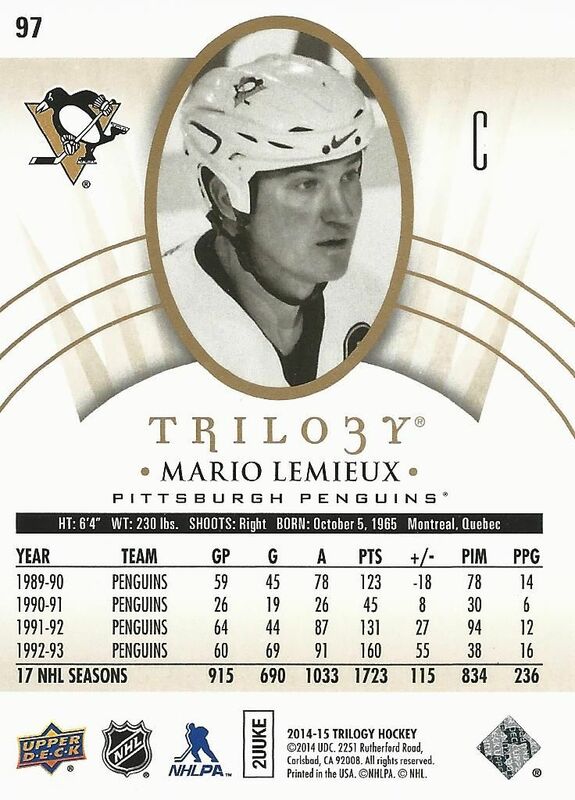 This year Trilogy gives collectors cards that are numbered to certain stats that a player has produced. 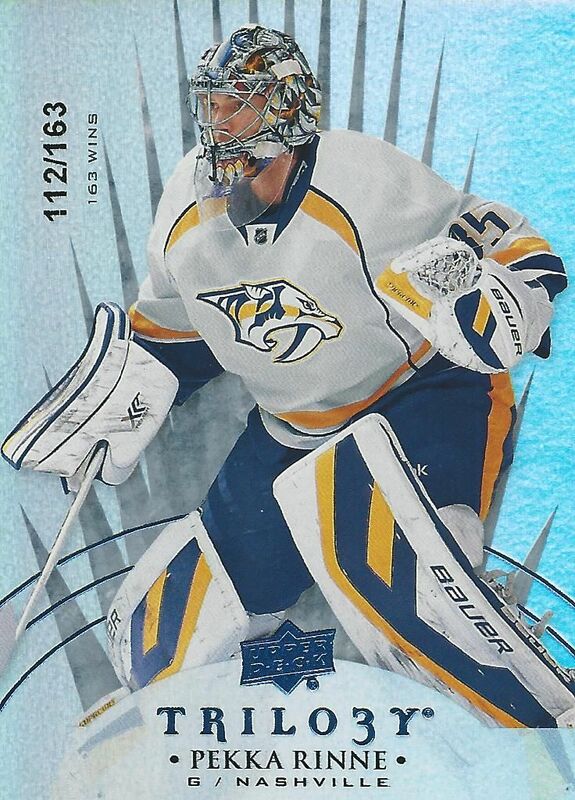 This Pekka Rinne card shown above is numbered to 163 because that was his win total. You can imagine that some cards could be numbered rather scarcely. These cards parallel the base card set and share the same design. The major difference in look is the foil - and it enhances the card quite a bit. 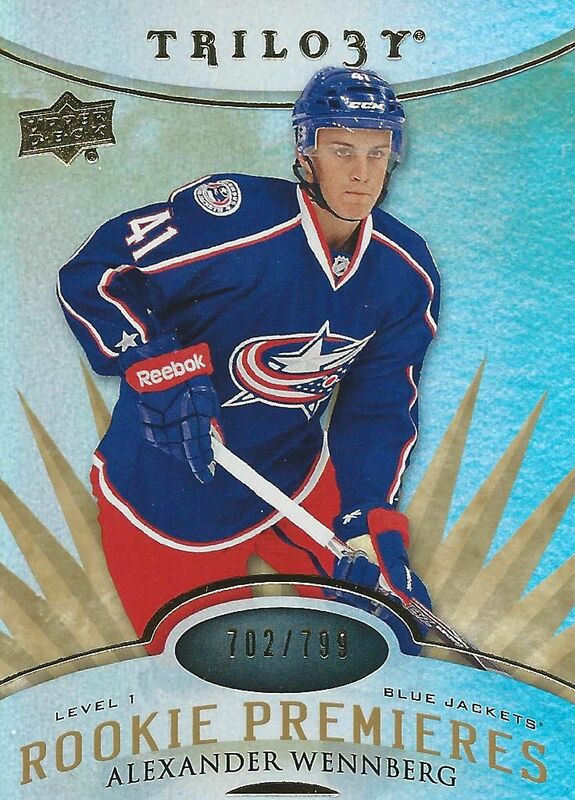 It might be hard to tell at first, but this level 2 rookie card is actually a parallel. The standard level 2 rookies are numbered to 399. This radiant green one is limited to just 99 copies. Rather than having gold foil, this card has green. It's a bit difficult to tell at first, but the numbering is an easy give-away. Upper Deck Crystal insert cards have been a mainstay in Trilogy for quite some time. These cards are thick acetate cards that make for a unique collectible. 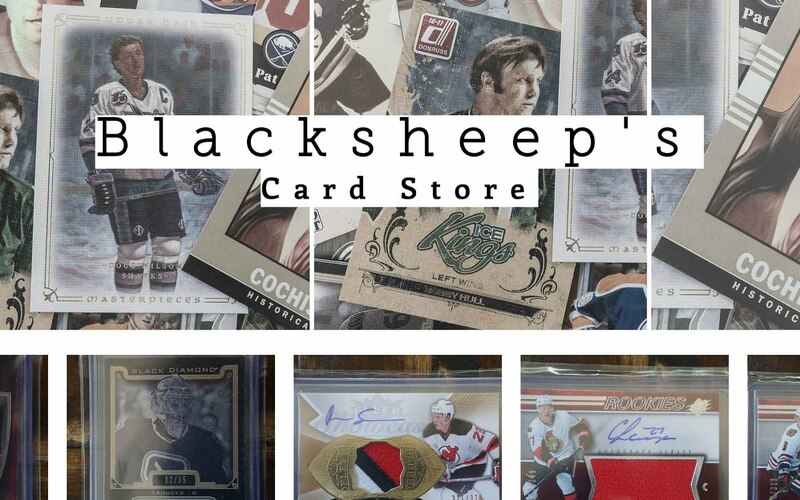 The cards are well-done and have quite a special look, but since the standard versions don't have an autograph or memorabilia piece attached to them, they aren't worth that much on the secondary market. I could imagine these being very valuable had they been in packs during the 90's though. They're just find themselves in the wrong era of collecting. Tryptichs are a inserts cards that form a three-panel card when put together. The most basic Tryptich card is the standard jersey. And these are very common to find. 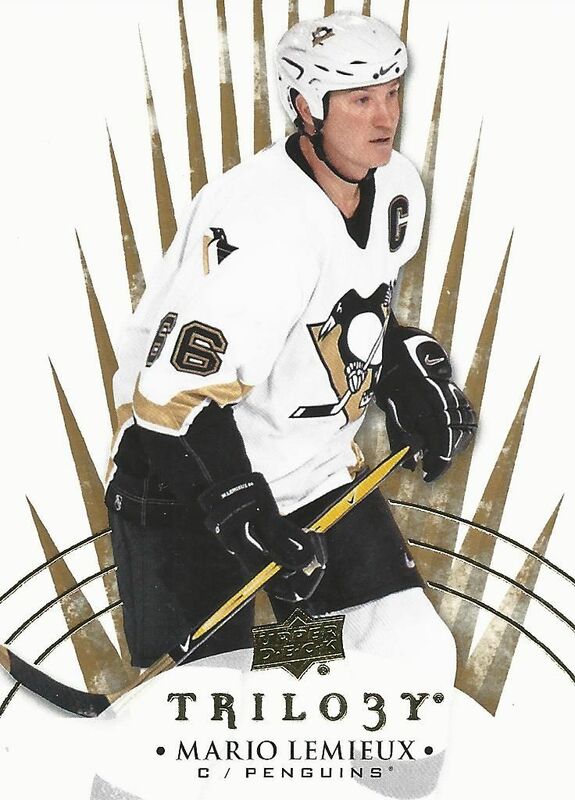 This Brett Hull card is numbered to 600! But the other versions that contain autographs, stick, patch, or tag pieces are much lower numbered. I think this insert set is a nice idea so that the standard jersey cards are actually a part of something greater. Though this idea has been done before by other companies, it was a nice one for Upper Deck to include here. The Signature Puck cards have made a return this year with an updated look. These cards come with a rubber puck imbedded in the card. Each puck has the autograph of the depicted player. Variations of the puck's logo can be found to add extra challenge for those who would collect a set of these. Though the configuration of Trilogy is a bit different this year, the insert cards and hit potential of the product is very similar to the way it was last year in its return to the hobby. If you enjoyed Trilogy last year, this year's break will give you a similar opening experience. Trilogy is a product that is full of variation. 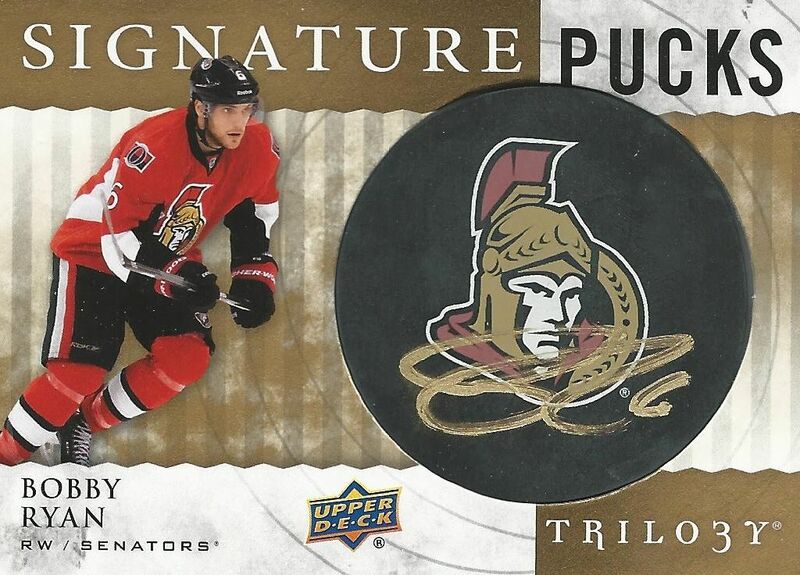 Collectors who purchase a box of Trilogy will find many versions of the various cards in the set. Trilogy contains quite a mix of veterans and rookies. I'd say it's one of the more balanced products in terms of finding both. Rookie Premier cards have never been a huge hit in the hobby, but Upper Deck has made strides in making them more desirable to collectors. Level 3 rookies with low numbering and an inscribed autograph is pretty cool. I would definitely try a box of Trilogy this year to get a sense of it and try my luck... but it isn't a product I'd want to by box after box of. It's a solid product with a nice amount of hits in it. 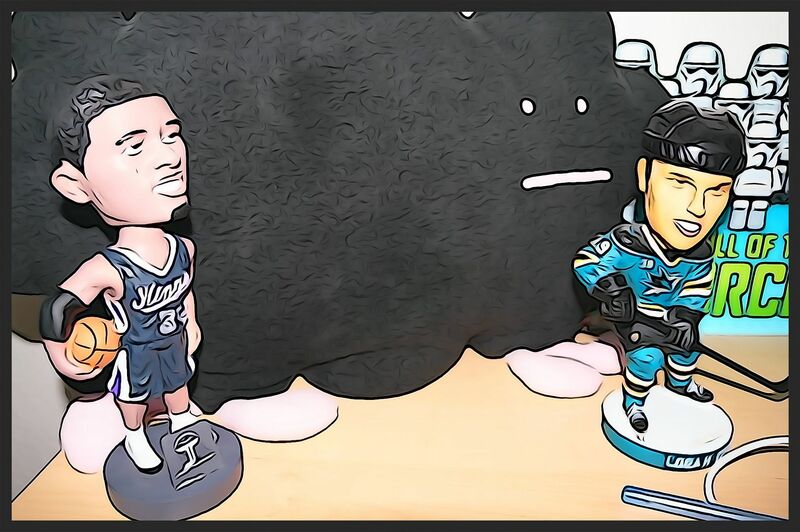 It certainly won't be Upper Deck's biggest product of the season, but does keep things interesting for collectors as the hockey season rolls on. Good review and good the pucks still is with the product. Just wish you would have more on card autographs of these upper deck products! Nice review. 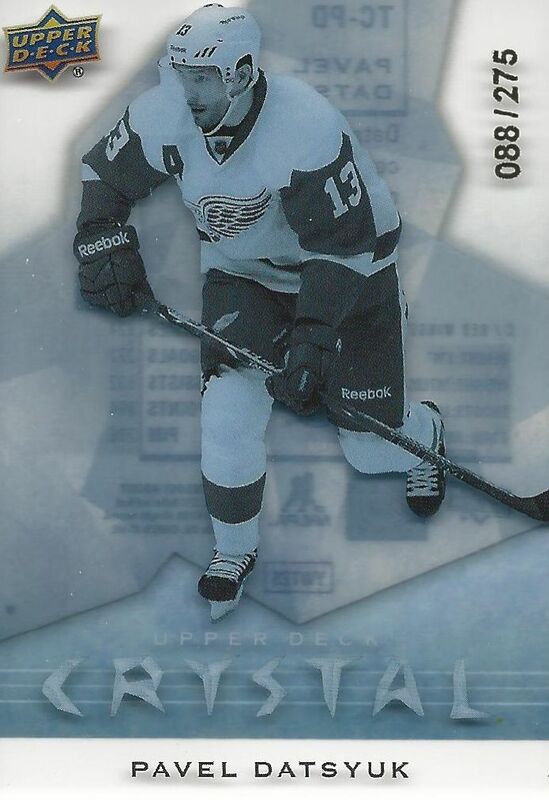 I really liked the datsyuk. Nice box. I'm glad they brought back the signature pucks. Another solid review and rating Luke! The triple level Rookie Premieres definitely makes it more exciting to try and hit. The foil parallel numbered cards (to specific stats) is a nice touch. 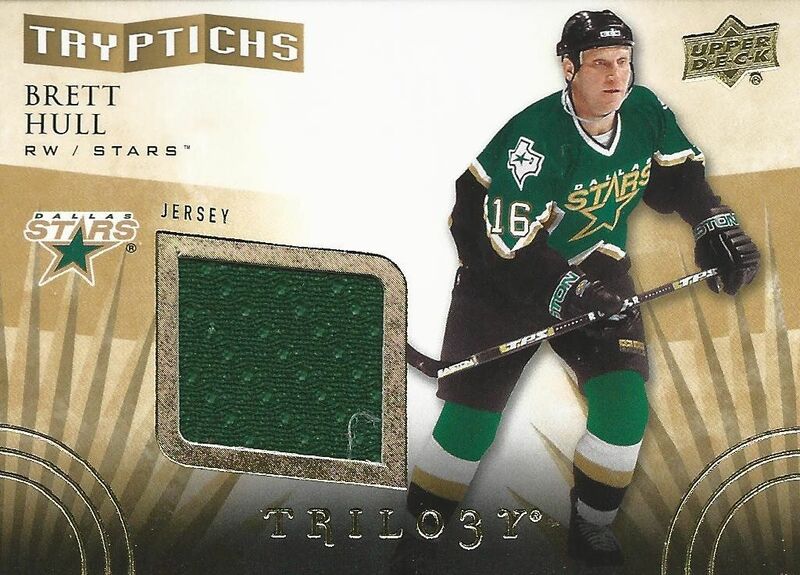 I've seen some nice Tryptichs relics - leg pads, blocker, that others have pulled but the design seems a tad basic for a memorabilia (even with the piece-3-of-them-together selling point). The design of Trilogy this year is very sleek and very nice. I like how the base jerseys are also numbered. SIGANTURE PUCKS ARE BACK !!! :D Nice break, nice product, nice review ! I really like the Plexi-Cards! Have one of Iginla from a past year Trilogy! Nice cards but a bit too pricey for me! Really liked the cool base and the hits were great. 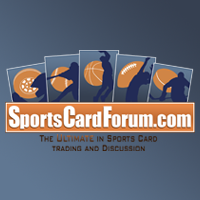 Not very exiting product overall but those crystal cards are awesome. Thanks for the review and the video. Really like the puck cards! I don't like the base cards all that much but I love that Hull jersey card! Also couldn't help but notice the weird numbering of the cards. I think they did a good job with the product. The hits look okay and would have liked it better if there were more on card autos but overall for the price I find it's a decent product. I personally love Trilogy this year!! Everything looks great, except for the Signature pucks. I hate the look, but love the concept. I personally prefer last years trilogy but nice box! Thanks for the box break! Love the videos! + Some well designed cards, like those with the foil. + Inscriptions to the autographs is a nice addition. After a while it gets a bit boring with the same kind of inscription written by every single player, though. 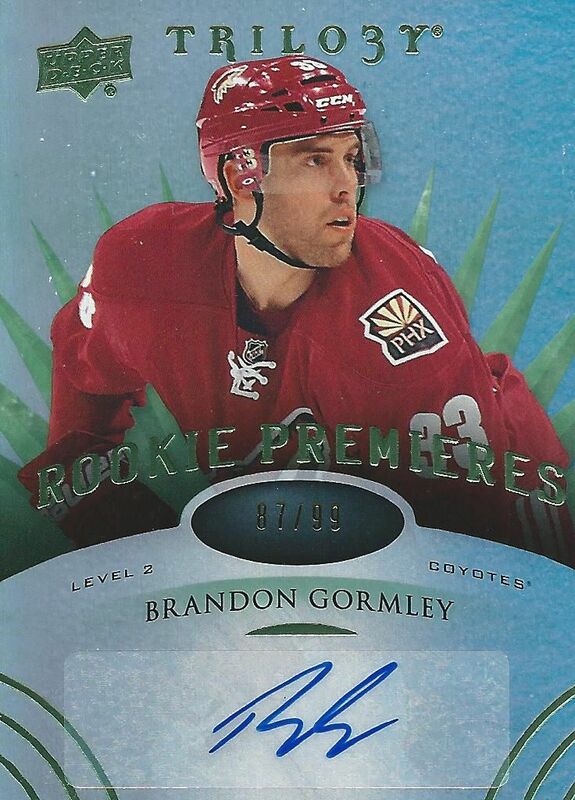 - I liked the Rookie Premiere cards better last season. This year it's harder for me to tell the differences between the levels of the cards. - I miss the Ice Scripts cards. With a lesser smudgy autograph they would've been a great hit to get.